Liquid handling systems are products that allows the dispensing of samples through them. In research organizations and laboratories, they mix solution of one type to other type. This solution has to be transferred at certain points of time in a repetitive manner to obtain the final solution. This proper timing in dispensing the solutions are taken by the liquid handling systems. Liquid handling systems are used in visualizing the synthetic genomics. 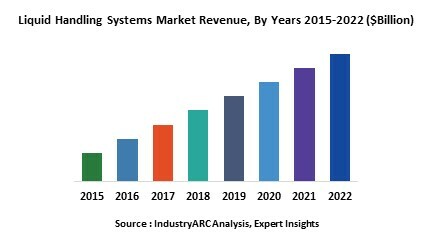 The market for liquid handling systems was valued at $2.919 billion and is expected to reach $3.362 billion by 2023 at an estimated CAGR of 2.4%. North America holds the largest share in the liquid handling market with 41%. Automated pipetting systems holds the highest share in the market with a share of $817 million in 2017. Liquid handling systems are of various types. There are electronic liquid handling systems, automated liquid handling systems and manual liquid handling systems. Electronic pipettes fall under the category of electronic liquid handling systems. The advantages over using the electronic pipettes are the time reduction and accuracy factors. These pipettes are programmed which can aspirate and dispense the liquid accurately. There are various types of liquid handling systems available in the market which include washers, pipettes, dispensers and many more. The washers provide a high throughput washing for ELISA, cellular assays and are also used in various other processes. Electronic liquid handling systems provides much accuracy than the traditional dispensing systems which is the major driver for the liquid handling systems market. The electronic liquid handling systems are also time consuming when compared to the other devices. The other driver for the liquid handling system is the assay miniaturization in drugs. The technique involves the increasing number of wells which helps the researchers to generate more data through these wells. Generation of these wells require the delivery of liquids, thereby increasing the demand for automated liquid handling systems. One of the major challenges in this market are the prices of the electronic and automated liquid handling systems. The software used in the automated liquid handling systems are extravagant. The other challenge is the integration of electronic components in the liquid handling system. When the integration of these materials increases then another major challenge arises which is the software interoperability. The base year of the study is 2017, with forecast done up to 2023. The study presents a thorough analysis of the competitive landscape, taking into account the market shares of the leading companies. It also provides information on unit shipments. These provide the key market participants with the necessary business intelligence and help them understand the future of the Liquid Handling Systems Market. The assessment includes the forecast, an overview of the competitive structure, the market shares of the competitors, as well as the market trends, market demands, market drivers, market challenges, and product analysis. The market drivers and restraints have been assessed to fathom their impact over the forecast period. This report further identifies the key opportunities for growth while also detailing the key challenges and possible threats. The key areas of focus include the types of plastics in the electric vehicle market, and their specific applications in different types of vehicles. Liquid Handling Systems Market–By Type: Electronic liquid handling systems, Automated liquid handling systems and Manual liquid handling systems. Liquid Handling Systems Market– By Modality: Fixed tips, Disposable tips. Liquid Handling Systems Market– By Application: Drug discovery, Forensics, Molecular biology, Clinical research and others. Liquid Handling Systems Market – By End user: Lab solutions, Research organizations, Pharmaceutical industries and others. Some of the Key players in this market that have been studied for this report include: Thermofisher Inc., Hamilton Company, Agilent Technologies, Gilson, PerkinElmer Inc., Mettler-Toledo International Inc. and many others. Hudson Robotics has launched Hudson SOLO™ a high-resolution dispenser in the year 2018. It has a high-throughput which can perform the transformations of DNA. This product has also the ability to handle the reactions in an infertile environment. Softlinx, a software by the Hudson Control Group is used in it which can facilitate the robotic pipettor integration with the robots. Eppendorf has launched ep Motion® 5075t NGS solution which is the combination of automatic liquid handler and software with the accessories for reliable Next Generation Sequencing sample. NGS when automated eludes the risk of pipette errors which ultimately increases the productivity. This product provides better results than those of the manual preparation method. Formulatrix Inc. which provides automated laboratory solutions has created a platform called Rover Laboratory Automation Platform which has dispensing tools, NGS specific accessories and NGS specific consumables. This product carries the microplates from instrument to instrument in a laboratory and also has sensors incorporated in it. These automated sensors helps in sensing the liquid levels and labware geometries. This platform is configured with the Mantis liquid handler which is a microfluidic dispenser and helps in providing the highly reproducible solutions. TTP Labtech Ltd., a company that provides liquid handling solutions has created a liquid handling system called Mosquito. This instrument was used by the Ferrier Research Institute to analyze the structure of proteins. This instrument has high speed, accuracy, and high precision pipetting. This product when combined with a single use disposable pipette tips which prevents the cross-contamination.